What's it about? 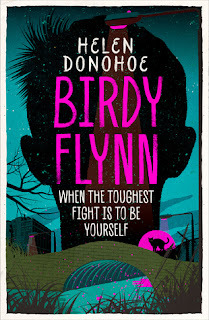 Set in the mid 80s, Birdy Flynn is twelve years old and lives in an unnamed British town with her family. Mum is Irish, Dad is Liverpudlian but from an Irish family. Birdy's elder brother Noely is living away from the family. Her sister Eileen is around. Birdy hangs out with the lads at the beginning of the novel and throughout the book her gender is questioned. She doesn't feel like a girl and is dreading puberty. However, I will use the pronoun 'her' for her because I don't think she is out as trans in her own mind, not even by the end. There is a lot of questioning and I like the way it was handled. Birdy keeps secrets. 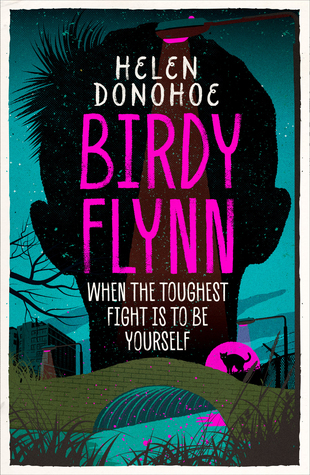 At the beginning of the book her dead Nan's cat Murphy is killed, and later on a teacher abuses Birdy at school. Birdy falls out with her friends and is pretty miserable for most of the book. Her parents don't get on well, with a backdrop of IRA bombings which lead to discrimination and bigoted comments about the Irish. I thought that using the Irish and the feelings around the IRA were a good metaphor for the way that Muslims are treated these days. I liked the vast majority of the novel but felt that the end was a bit lacking. I thought Birdy was an excellent character and I really liked Kat, Mum, and Eileen too. A pretty good middle grade book about families and secrets and gender and growing up. Are any main characters LGBTQ+? I'm going to go ahead and say yes, even though as I said before I don't think Birdy knows exactly how she identifies. Would I recommend the book? Yes, for tweens. Where is the book going now? I'll keep it most probably.